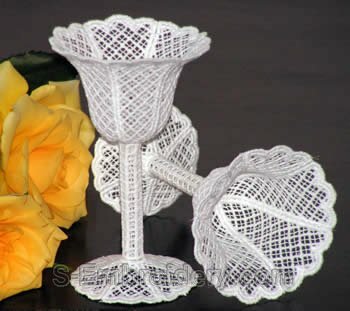 A fine set of 3 freestanding lace wedding goblet machine embroidery. Each of the goblet design is available in 2 sizes. The large goblets are 4.75 inches (12 cm) high and the bowl has a diameter of 3.15 inches (8 cm) and the small ones are 4 inches (10 cm) high with a bowl diameter of 2.5 inches (6.5 cm). 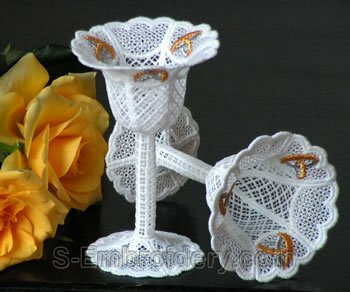 A delicate freestanding lace wedding goblet with wedding rings decorations. 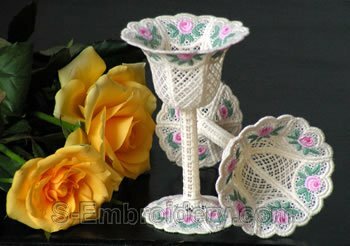 A fine freestanding lace wedding goblet machine embroidery with minirose decorations.